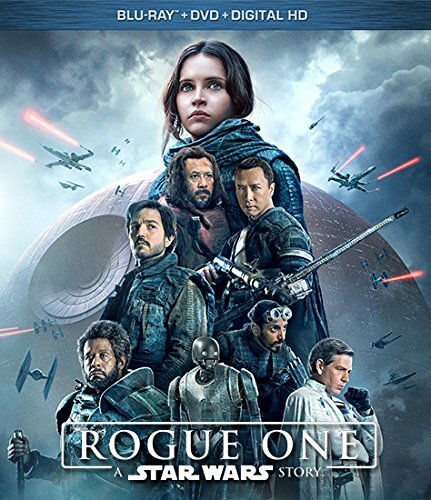 I saw Rogue One: A Star Wars Story in the theater like most people, and while I loved the look and feel of the movie I wasn't excited by the story or the characters. Sometimes an attitude towards a film can be affected by the mood of the watcher at the time of the viewing, so I was hoping that was the case with me. Plus, sometimes it takes multiple viewings to really "get" a movie. I just recently got this movie on brilliant high definition blu-ray and I have to say that my opinion didn't change a whole lot after this second viewing. I did like it a bit more but I think that's only because the first time I didn't really understand what was going on for the first half of the movie. Unlike the other Star Wars films, this one has no opening crawl. Mildly disappointing, but I understand the decision and am fine with it. My dislikes really started after the opening sequence after the opening scene ends and we begin to jump around to a bunch of locations in a very short amount of time. It starts out in the past with the main character, Jyn Erso, as a kid. She's being rescued by a friend of the family after hiding from imperials. After that sequence, which is about 6 minutes, we get the title of the movie, Rogue One, and are moved to a scene with her now an adult and in what looks to be a prison cell. Nothing really happens in this scene and about 45 seconds later we're out in space looking at a trading output in the Ring of Kafrene. Is this where the prison is? We're taken inside this outpost and it doesn't look anything like the prison so I guess not. Instead, we're introduced to a new character. His name is Cassian Andor, but we don't know that yet. At this point he's just some guy with a thick blue coat who's talking to some other panicy guy that's dropping a bunch of names that I don't recognize. So I really don't get much out of that scene. Two minutes later and now we're somewhere else, a moon called Jedha, and we're introduced to some other nameless guy, a defector pilot, who really wants to meet with some other guy. That scene lasts about a minute and now we're looking at a planet called Wobani. Jyn is here, but in a prison transport, not a prison cell, and she gets rescued by rebels. That whole scene lasts about a minute and then we're on to another location, Yavin 4. The first time watching this movie I was just baffled and had no idea what was going on. So many scenes in such a short amount of time that didn't add up to anything comprehensible. The second time through I knew the story so I was able to follow what was going on, but even then it felt too disconnected. Slow down! The next issue I had with the movie is that I really didn't like the main character, Jyn. In the scene I described above briefly, we find her shackled in the back of a prison transport. The door is blown open, the stormtrooper guards are shot, and the rebels move into the transport with one of them going directly to Jyn Erso and asking if she wants to get out of here. She nods yes, he unlocks her restraints, and she immediately kicks him, punches another, and smacks another with a shovel as she breaks for the exit. WTF?! Some some hell of a way to say thanks. And from here on out she pretty much acts like a jerk, caring only about herself and not really growing as a character. She does come around, but it's really late into the film and it's pretty abrupt, and by that point I don't really care. Those were the two main issues that made me not an immediate fan of this movie, but there were others. Grand Moff Tarkin, for example. They used CGI to bring him back from the dead, but it just looked weird. The technology isn't quite there yet and I think they should have simply recast him with a look alike. Even the second time through I don't really know what he was saying because I was too busy staring at his freaky CGI face and thinking how creepy he looked. Then there was Darth Vader. I loved seeing Vader, but it seemed like they could have found a better place for him. His scene at the very end of the film felt right and was way cool, but his scene in the middle felt pointless, like it was just there so we could see him and for no other actual reason. Plus, he had this one really corny line that I can't believe they didn't cut out. While I obviously did have some problems with this movie, there were good parts as well. It looked and felt like the original film, which was very nice. I liked the new droid K-2SO who looked cool and had a dry sense of humor which added some needed comic relief. I liked the duo of Chirru and Baze, two warriors who used to guard the kyber crystals that power Jedi lightsabers. I wish we could have seen more of them, they were way more interesting than Jyn and Cassian. I also like how it ended... and I'm going to spoil it here so if you haven't seen it then skip to the next paragraph... every one of our main characters die. It didn't have any emotional impact because I never grew to care about these characters, but I still liked that they killed them off and didn't go for the ultra super mega happy ending. Overall I just found it to be a so-so movie, better by far than any of the prequels but definitely not better than any of the original films or Episode VII. I know they'll be making more standalone Star Wars films and I'm looking forward to them, especially if they finally move away from Death Star plots. Enough with the giant planet-killers already! All these extras are almost like a separate movie unto itself. I enjoyed them but was quite disappointed that there were no deleted scenes. We know there were deleted scenes because pretty much everything we were shown in the trailers were missing from the film, so what the heck? I would have liked to see what was cut and hear about why. Still, there is alot here and whether you loved it or just thought it was so-so, you'll probably be picking it up to add to your Star Wars collection. Rogue One: A Star Wars Story [Blu-ray+DVD+Digital HD] , released by Walt Disney Studios, is available starting April 4, 2017. To create the distinctive and contemporary look of the film, Edwards chose revered cinematographer Greig Fraser (“Zero Dark Thirty,” “Foxcatcher”). Visual effects supervisors John Knoll and Mohen Leo (Marvel Studios’ “Ant-Man,” “The Martian”) team up with special effects supervisor Neil Corbould (“Black Hawk Down,” “Saving Private Ryan”) and ILM animation supervisor Hal Hickel (“Pirates of the Caribbean: Dead Man's Chest,” “Iron Man”). Star Wars veteran Doug Chiang (Star Wars Episodes I and II, “Forrest Gump”) and Neil Lamont (supervising art director on “The Force Awakens” and the “Harry Potter” film series) join forces as production designers, and Neal Scanlan (“Prometheus”) returns to do special creature effects, having recently worked on “Star Wars: The Force Awakens.” Additional key crew include costume designers Dave Crossman (costume supervisor on The Force Awakens and the “Harry Potter” film series) and Glyn Dillon (“The Force Awakens” and “Kingsman: The Secret Service” costume concept artist), as well as stunt coordinator Rob Inch (“The Force Awakens,” “World War Z”).